In this episode wrap up our study of Gaudete Et Exsultate with chapters 4 & 5. 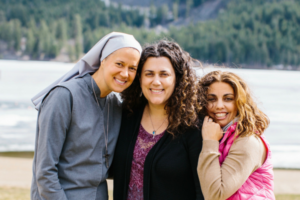 We talk about everything from bullying on social media, the pitfalls of gossip, discernment, and how we can get rid of the poser and experience freedom in humility and poverty of spirit. We also talk about the gift of joy in the midst of struggle and living holiness in the small things. Michelle’s One Thing – That the Golden State Warriors won the State Championship! How is God calling you to grow in having beautiful speech in relationships and on social media? Discuss how humility and acceptance of your own poverty can increase your dependence on God? Pope Francis says that “unless you let him warm you more and more with His love and tenderness you will not catch fire and how will you be able to set the hearts of others on fire”. Are you experiencing a dynamic encounter with God? If not, how could you begin this relationship? Am I excluding God from any area of my life because of fear? What am I passing on to people through my witness? Is it rule following, a good way to live, or a vibrant and personal relationship with God? Am I spending time listening to the heart of God and giving to others from that place? Spend some time with God, what is He saying to you this week?